Opening reception: Friday, June 01, 2018, 5-7 P.M.
New Concept Gallery is pleased to invite you to our June exhibit, “Human Nature,” which will showcase photographs and bronzes by Santa Fe photographer and sculptor Bill Heckel. The show will open with an artist’s reception from 5-7 PM on Friday, June 01, 2018. The show will be on view through June 30, 2018, at the New Concept Gallery, 610 Canyon Road, Santa Fe, NM. The photographs in “Human Nature” are the fruit of over two decades of Bill Heckel's exploration of the remote wilderness areas of New Mexico. Accompanied by adventurous, courageous models, Bill has journeyed down little-used backroads and wildlife trails to some of New Mexico’s most spectacular locations. In this dramatic setting, model and photographer work collaboratively to combine their creative visions. 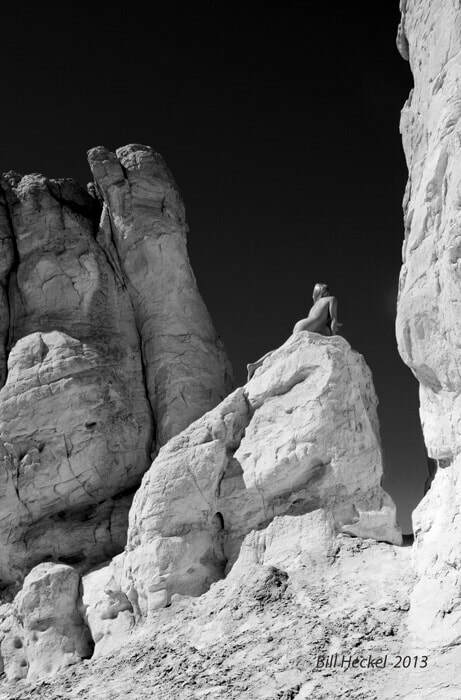 The result: Stunning images of the southwestern landscape as backdrop to empowered women, cliffs and expansive skies juxtaposed with the timeless beauty of the female form. As a counterpoint to his photography, Heckel will also show many of his bronze sculptures of female nudes. Sculpture has become a vital aspect of Bill’s artistic process, as the three-dimensional play of light and shadow invigorates and renews his perception of light as seen through the camera lens. Work by other New Concept Gallery sculptors will also be on display.